As working parents, my husband and I often feel guilty for having to leave Leon behind and spend most of our days at work. I, for a fact, feel that pang of guilt everytime I see him cry and deal with his separation anxiety each time I leave the house. 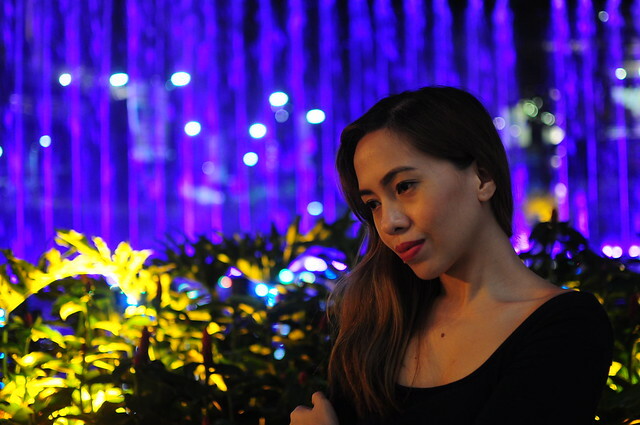 It has been my dilemna since I gave birth but I guess as time pass, as Leon grows older, we get used to the system and find ways to make sure that our presence is always felt despite our absence. That is why we make sure that weekends are sacred for spending time with Leon. On a typical Saturday or Sunday, the three of us usually go out (to a mall, or any place) and spend time with each other. My mom (who I am truly truly grateful for) takes care of Leon on weekdays and when she is not available, Ate Juvy, Paolo's long time househelp takes charge. 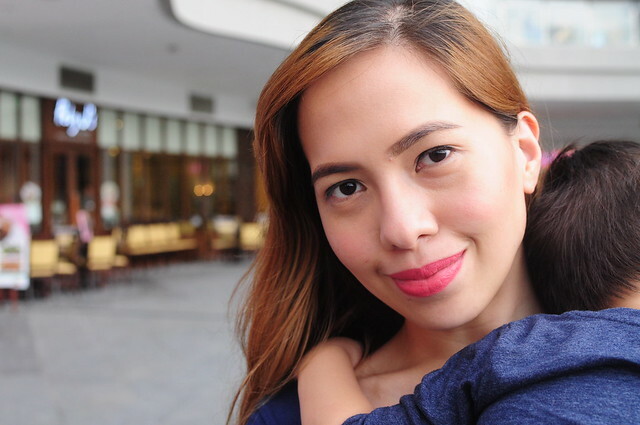 We are grateful to have found people we deeply trust to take care with our unico hijo (because finding a yaya on this day and age is very very hard). During weeknights (if time permits) and on weekends (unless there are events we could not miss),Paolo and I prefer to take care of Leon as hands-on as we can. To give you an idea how we usually spend our weekend, this post would run you through on how our typical family day goes every weekend. Bringing Leon around requires tremendous amount of physical energy and patience that we got used to it already. 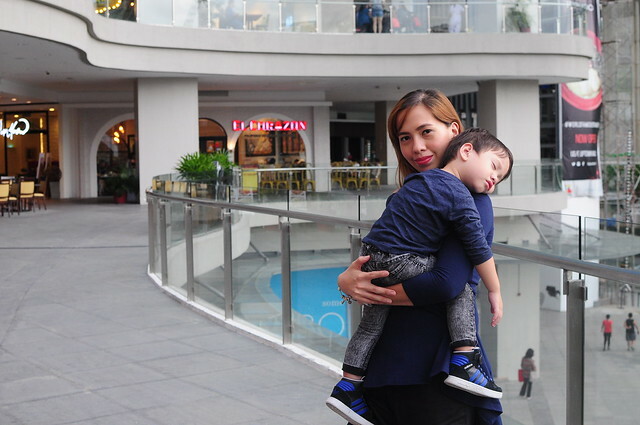 Currently, Leon enjoys going to play areas like Kidzoona, Tom's World, Timezone, etc and we usually bring him there every weekend. We make sure to go out on weekends and let him play around cause he is usually exposed to gadgets at home. (It's our way of detoxifying him). 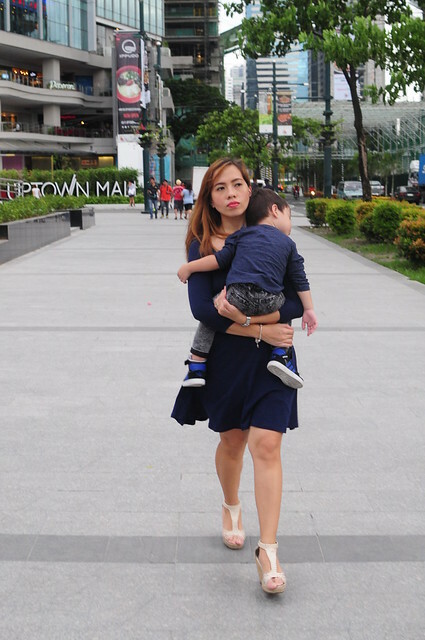 Whenever we're out, I am either chasing Leon around or carry him until we find our stop. Leon is on that age where he prefers to walk and run and we usually forget to bring his stroller so we had to suffer the consequences. Kidding aside, Leon only plays with his stroller, doesn't sit on it for long, or easily wakes when we put him there so we stopped bringing the stroller whenever we go out. Then we have our lunch or dinner. 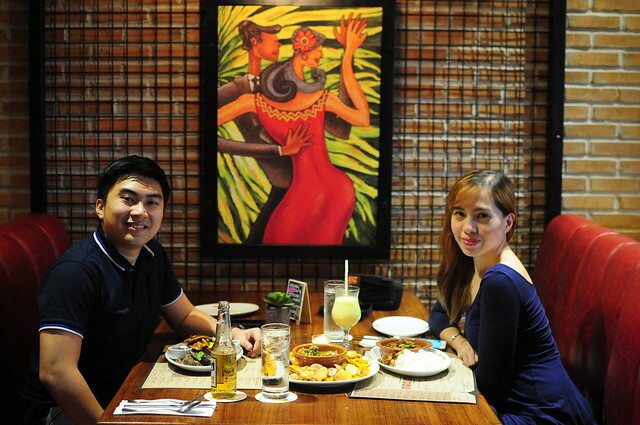 In this photo set, we had dinner in Naxional Uptown BGC in lieu of our 12th anniversary as a couple last September. Whenever we dine with Leon, we usually prefer to dine in the couch area so we could Leon could sit (like a big boy, and eat like us) or in this case, we have enough space to lie Leon down for him to sleep. Sleeping or not, we continue walking around the mall. By this time, Paolo would take his turn in carrying Leon. I admit, carrying Leon around is no joke! He weighs 13kgs now and getting heavier each day. 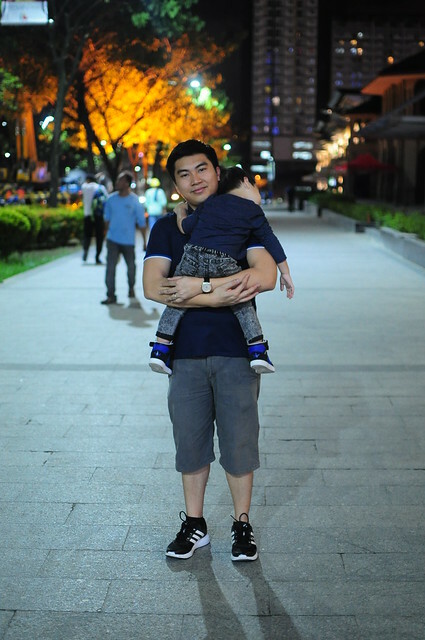 I remember there was a time when Leon was not comfortable being carried by his dad, so I had to do everything on my own. At least now, luckily, Leon is more warmed up now with Paolo, that he now enjoys being carried (or even playing) with his dad. Since we promised Leon that we will bring him to Kidzoona that day, Paolo and I waited for him to wakeup. Leon is so obssessed with Kidzoona that there's no day he won't tell us to bring him to Kidzoona or Timezone or wherever. We also enjoy watching him play and interact with other kids as we feel that it is the best way for him to learn new things and be more sociable. We let him play so he could be more confident in trying new things, be curious in discovering things and be friendly to other kids. Even if we are already tired from all the carrying and the chasing around, we still find that energy to watch him play and have fun. 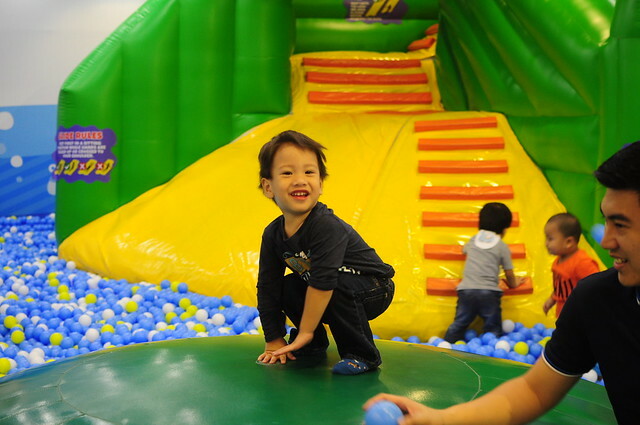 Here's a photo of him having so much fun in Kidzoona, Uptown Mall.